Kapsalon is a fast food dish created in 2003 in the Dutch city of Rotterdam, consisting of a layer of fries placed into a disposable metal take-away tray, topped with shawarma meat, covered with slices of Gouda cheese, and heated in an oven until the cheese melts. Then a layer of shredded iceberg lettuce is added, dressed with garlic sauce and sambal, a hot sauce from the former Dutch colony of Indonesia. The term kapsalon is Dutch for "hair salon", alluding to one of the inventors of the dish who worked as a hairdresser. The dish has spread internationally in a relatively short time. The dish was conceived in 2003 by Nathaniël Gomes, a Cape Verdian hairdresser in the Rotterdam district of Delfshaven, who one day at the neighboring shawarma store "El Aviva" asked to combine all his favorite ingredients into one dish. He began regularly to request what the restaurant called "the usual order for the kapsalon". Other customers noticed and started to order the kapsalon too, and it became a "hit", soon being demanded in nearby snack bars. The dish has since spread around the Netherlands into Belgium, among other countries. In some places the shawarma meat may be replaced with fish, chicken, or doner kebab meat. The kapsalon has been described as "a typical example of contemporary cultural heritage", and "representative of the transnational nature of the city". It has also been described as a "calorie bomb" and "culinary lethal weapon", with high fat content and up to 1,800 kilocalories (7,531 kJ) in a large serving. The kapsalon reached the Nepalese capital city of Kathmandu in 2017, when a chef returning from a visit to the Netherlands was asked to prepare a "typically Dutch" meal. Now chicken or fish replace the shawarma meat, and a porcelain plate substitutes for the metal tray, but the kapsalon has become fashionable, with many people posting photos and a prominent food blogger describing the dish as "a party in her mouth with her favorite tastes". ^ a b c d e Sterre Lindhout (14 September 2011). "Culinair moordwapen" [Culinary lethal weapon]. Volkskrant (in Dutch). ^ Lester Haines (7 October 2011). "Post-pub nosh deathmatch: Kapsalon v quesadillas". The Register. ^ a b "Caloriebom Kapsalon: erg lekker!" [Caloric bomb Kapsalon: very tasty!] (in Dutch). Algemeen Dagblad. 23 August 2006. Archived from the original on 30 June 2015. 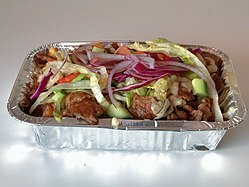 ^ "Nieuwste kebabhit 'het kapsalon' verovert Vlaanderen" [Newest kebab-hit 'Kapsalon' conquers Flanders]. vandaag.be (in Dutch). 21 December 2011. ^ Leo Roubos (14 September 2011). "'Kapsalon is cultureel erfgoed van toekomst'" ['Kapsalon is cultural heritage of the future']. RTV Rijnmond (in Dutch). ^ Wesley Schouwenaars. "Kapsalon is 'een feestje' in Nepalese mond". BNR.nl. This page was last edited on 1 April 2019, at 23:16 (UTC).